This blog post was a guest post. It does not represent best quality practice. Please read a later blog post shows a genuinely best practice pinch-point design. This is another before and after view in 's-Hertogenbosch. And it is an interesting street because in the before situation there was no cycling infrastructure at all, which is rare for a more important street in the Netherlands. 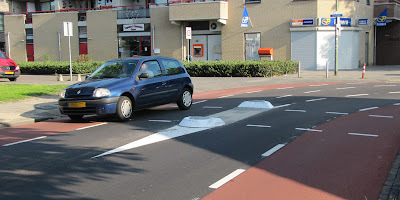 But also in the after situation the city of 's-Hertogenbosch choose to build cycle lanes and not cycle paths. There are far less cycle lanes than cycle paths in the Netherlands but here they were deliberately chosen. This will have to do with the fact that the number of cars using this street is relatively low. Because although it is a main route for cyclists, it is not a main arterial route for cars. For motorised traffic this is just a 'neighbourhood connector road'. Meaning it serves as the access road for a particular part of the city but it does not provide a fast through route for cars that need to be in a different part of the city. The remaining car lanes are narrower than the cycle lanes. What is also interesting to see, is that the minimal width of the cycle paths was maintained even if that meant that the remaining space for the car lanes was too narrow to even fit a car. (As can be seen in the picture above.) This means that motorists will sometimes have to drive over the sides of the cycle lane. But because of the colour they know they are invading the space of cyclists while they are driving at that narrow spot. Most if not all drivers will sub-consiously reduce their speed and look out for cyclists. The red of the cycle lane is not paint, it is a coloured asphalt so it the colour will not wear off. Which is especially important now that cars drive over it in part. The street (in black with arrow) is just a tiny fragment of the city's main cycling network. 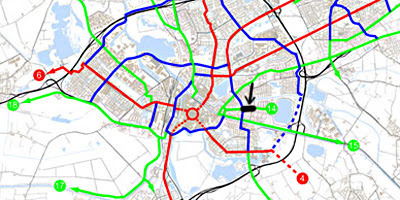 The city of 's-Hertogenbosch is updating its entire cycle network under a 2009 cycling plan. This street is just a tiny fragment of the network. Google streetView shows the 'before' situation. I have to say, Mark, that I'm not impressed with this. The concrete in the middle of the road creates a pinch-point and drivers will pull sideways into the cycle lane when they get to that point. If a device is needed to slow down motorists, it could be done differently. Perhaps two concrete structures, protecting each cycle lane and forcing drivers going in opposing directions to slow down and negotiate. It reminds me of places in the UK where I had problems in the past. For example, here and here. However, context makes a huge difference. The cycle lanes in your example are wider than is typical in the UK, and I would hope that motor traffic levels are lower. Hi David, I think you are a bit too demanding here ;-). The situations in your links are not comparable either in my opinion. While I agree that there seem to be better options than what they have built, the concrete in the middle is really no problem. It is only just before a 90 degree turn so cars have to (and do) slow down there to almost walking pace. The pinch point was there in the before situation too and because of the big red piece of asphalt now, it is better than it was. The rest of the pinch points can be driven over, which was not the case in the before situation, AND there are the huge cycle lanes there too now. So it is now more clear which part of the road belongs to whom. Also the middle stripes disappeared what makes that on-coming motorised traffic now has to negotiate rather than that they just go to the side on the path of the cyclists. Of course I would have rather seen a separate cycle path here too (which could be done with this size street) but the amount of motorised traffic is really very low so that would have been a bit overdone. All in all, this is an improvement over the before situation. Joking aside, the cycle lane doesn't look very dangerous on the video, so I guess it'll work. That design looks like a bad precedent to me as well. If the traffic level is so low, why is a pedestrian refuge (which is what it appears to be – have I got this wrong?) necessary anyway? And if the cars are slowed so much for the bend anyway, why do they need the constriction? Regarding the comments of now both Davids. Since I still didn't understood what you two saw that I don't ('bad design'), I rewatched the video and now I think I understand you two focus on the part from about 10 to 30 seconds. What you see there is exceptional design for an exceptional situation. It is the edge of a square with a small number of shops. Because of the shops there is parking at a 90 degree angle (to the left in the video) and cars going in and out of these parking bays need to be able to make that turn, without hindering other traffic too much. That is why the two middle lines are in the street. To give cars room for that action. That area begins and ends with a T-junction and just connecting the lines until these crossings creates room to wait for pedestrians, but I don't think that was created as a true pedestrian refuge. It just 'emerged' as an added bonus because of the traffic calming and traffic regulating measurement that these lines really are. Mark, thanks for your explanation. What you say of course makes a lot of sense. I'm sure that you wouldn't have used it as an example if you didn't think it was a good example. In a sense, this is quite interesting in itself. It's a cultural thing. I think that what we're concerned about is that if you were to look at it from a British road designer's point of view, you squinted a bit, and took it out of context, this could almost seem like providing an example of the same thing, even though it really is not the same. I'll show you another example. This and This were built on one of my commuting routes in the UK. The road has a 30 mph (50 km/h) speed limit, but only just. Just a few short metres before the first example, the limit is 60 mph (100 km/h). Many drivers didn't slow much by that point. They came a lot closer to me on the lower speed limit road than on the 60 mph section. Those reservations were, and appear to remain, dangerous. Context is very important, of course. In your example, a car travelling at 100 km/h would be very unlikely. You'd never find an example like this on a Dutch A road (N Road in the Netherlands) with cyclists "sharing the road" in such conditions. Are cyclists allowed to cycle two aside on the road, as they do in the before part of the video? In Germany that's almost always forbidden and you would get honked at a lot. Drivers might even completely forget to overtake you facing such an “unbelievable traffic hinderance”. @Wolfgang: Yes, that is the basic rule in the Netherlands: cyclists are always allowed to cycle two abreast. On cycle paths (that is why those are almost always double the width of German paths) and also on the road. There is a small 'unless' in the law that says something like 'unless that is absolutely impossible' but that is hardly ever the case anymore. The underlying reason for this behaviour and law is that cycling is considered to be a social activity and also parents need to be able to cycle next to their child. This is indeed the main difference between the Netherlands and any other country in the world (including Denmark) where cycling two abreast is almost always forbidden unless marked otherwise. @David Hembrow. Your two new examples do indeed look the same but as you state they are completely different. This is a residential street, not an A-road or an equivalent. The speed is 50kph and because of the turn no car could even get to 100kph in such a short stretch of road. The second part of the street is really what makes clear that it is indeed a residential street: the center line was removed and because of the red cycle lanes the room left for cars is not wide enough for two cars to pass. Since the cycle lanes are so clearly standing out drivers sub consciously understand that while they are negotiating passage with another motor vehicle they have to invade that space of cyclists which they can only do when there is no cyclist. If there is a cyclist they have to wait for those cyclists. This makes it impossible to drive at high speeds in this street in the first place. THAT is what this design is about. Cycling 2 abreast on the road is legal in the UK, AFAIUI. Of course that won't stop you being shouted at and of course no cycle lane/path is wide enough for that. Speaking of "road improvements", I've stumbled upon the N208 project in Hillegom (from Fietsersbond article mentioning their success at getting asphalt instead of tiles for the cycle path material). The documents are in Dutch but the maps are pretty detailed. For those who are interested, compare the current situation with Google Street View (busy, noisy, community-damaging thoroughfare) with what's planned: roundabouts with priority for cyclists, proper off-road cycle paths, traffic lanes reduction and so on. And the way they've been managing this project also seems interesting : detailed maps, information to the public with a "newspaper", involvement of the community in meetings, etc. What the Dutch deliver -- and how they do it -- is pretty impressive from my point of view !